We’ve already mentioned how psyched we are about our own unreal official SXSW showcase this year, going down Thursday night at the Hype Hotel presented by Feed the Beat (aka the Fair Market building on East 5th), and brought to you by Mazda, official automobile sponsor of #HypeON. The blogger-curated Hype Hotel lineup — which you can preview here — is seriously stacked pretty much every day this year, and features the likes of Autre Ne Veut, Earl Sweatshirt, Viet Cong, SOPHIE, A. G. Cook, iLoveMakonnen, Leon Bridges, Rae Sremmurd, Ryan Hemsworth, Alvvays + a ton more. RSVP is now closed for Hype Hotel, but you can get into the Thursday night GVB show with a SXSW badge, and you can try and cut the line. 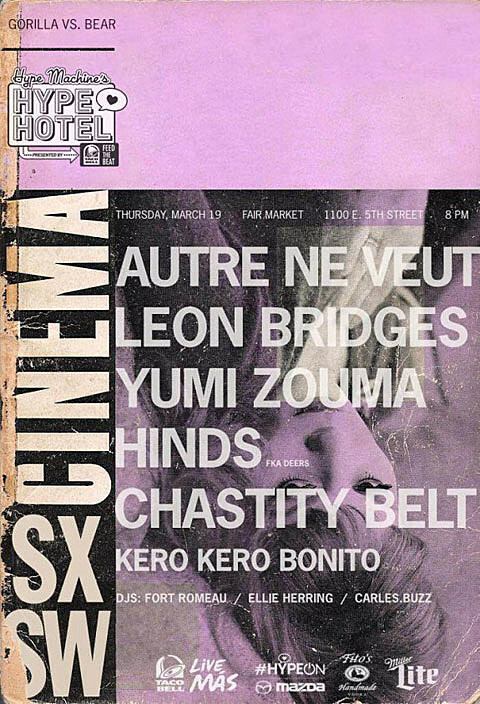 As you can see in the flyer above, Gorilla Vs Bear’s lineup features one of the few Autre Ne Veut sets at SXSW this year, along with the super hot Leon Bridges, Yumi Zouma (who also play a BV show), Hinds, and Chastity Belt (who play a BV show too).